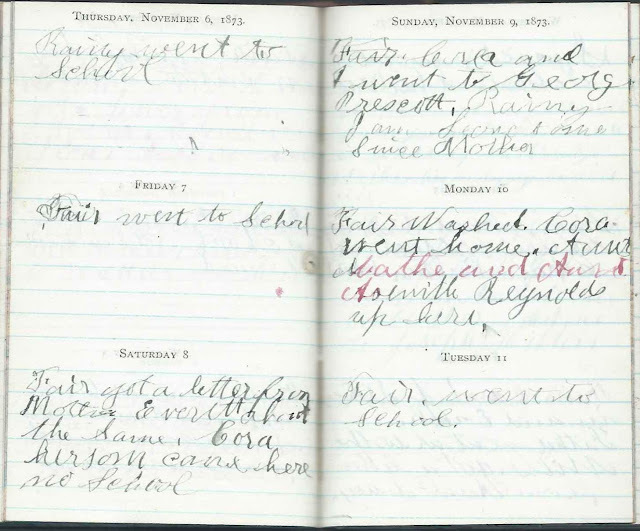 November entries in the 1873 diary of Ida Isadore Reynolds (1860-1946) of Acton, Maine. Ida would marry John Jotham Shapleigh (1856-1923) in 1881. Links to the months of October 1873 and December 1873 appear here and at the end of this post. Thursday, November 6, 1873: Rainy. Went to School. 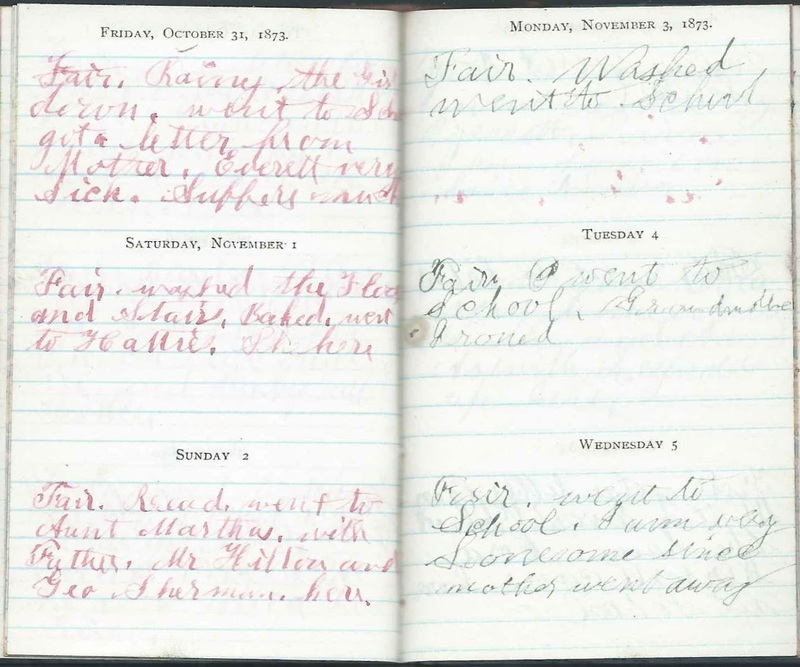 Friday, November 7, 1873: Fair. Went to School. Saturday, November 8, 1873: Fair. Got a letter from Mother. Everett about the Same. Cora Hersom came here. No School. Monday, November 10, 1873: Fair. Washed. Cora went home. Aunt Martha and Aunt Asenith Reynolds up here. 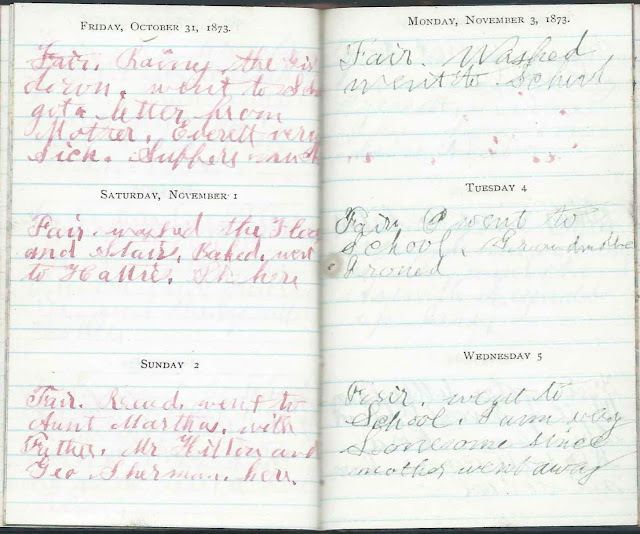 Tuesday, November 11, 1873: Fair. Went to School. Wednesday, November 12, 1873: Snowed. Went to School. Studied. Thursday, November 13, 1873: Fair. Went to Hattie's. Willie Prescott and Charles Hilton here. Friday, November 14, 1873: Fair. C and J Stevens in and Enoch. Father went up to the Mills. Got a letter from Aunt Lucy. Saturday, November 15, 1873: Fair. Went to school. Got a letter from Mother and one for Everett from Joseph Hilton. Everett is worse. If the neuralgia strikes his kidneys he will die. Sunday, November 16, 1873: Stormy. Father and Enoch went up to the Mills to put my letter in. I wrote one to Mother and one to Joseph Hilton. 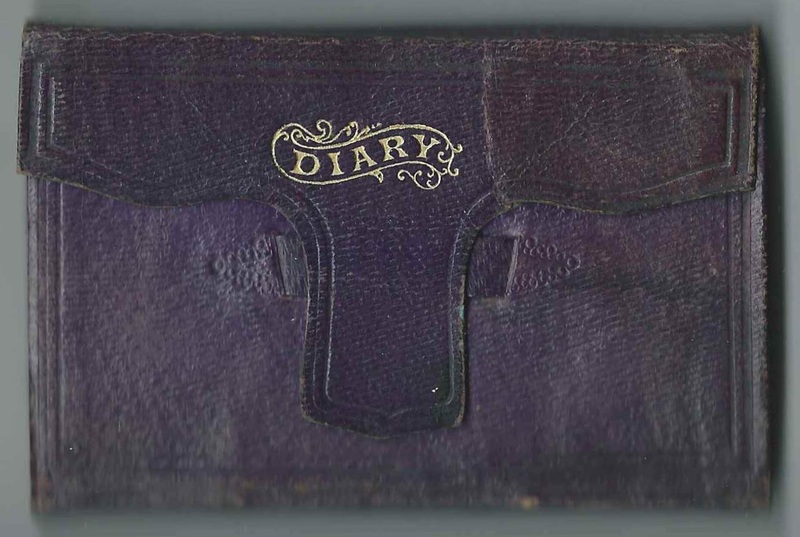 Monday, November 17, 1873: Fair. Went to School. Tuesday, November 18, 1873: Snowy. Did not go to School. It was So Stormy. Got a letter. Everett a little better. 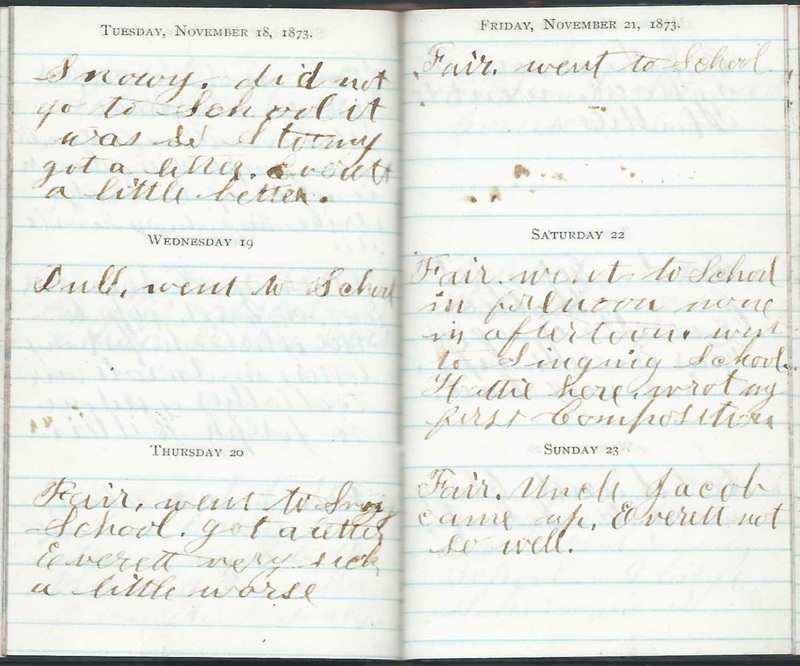 Wednesday, November 19, 1873: Dull. Went to School. Thursday, November 20, 1873: Fair. Went to Singing School. Got a letter. Everett very sick, a little worse. Friday, November 21, 1873: Fair. Went to School. Saturday, November 22, 1873: Fair. Went to School in forenoon. None in afternoon. Went to Singing School. Hattie here. Wrote my first Composition. Sunday, November 23, 1873: Fair. Uncle Jacob came up. Everett not so well. Sunday, November 30, 1873: Cold. Went to Hattie's. Sung. Monday, December 1, 1873: Fair. Went to School. Went to Singing School. Tuesday, December 2, 1873: Stormy. Went to School. Went to George Prescott's. Very Cold. 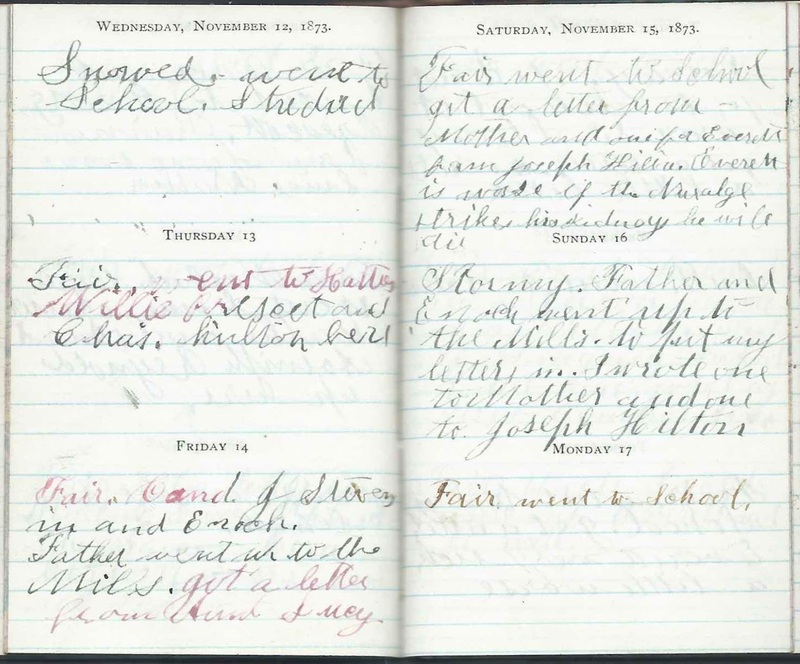 Wednesday, December 3, 1873: I went to School. 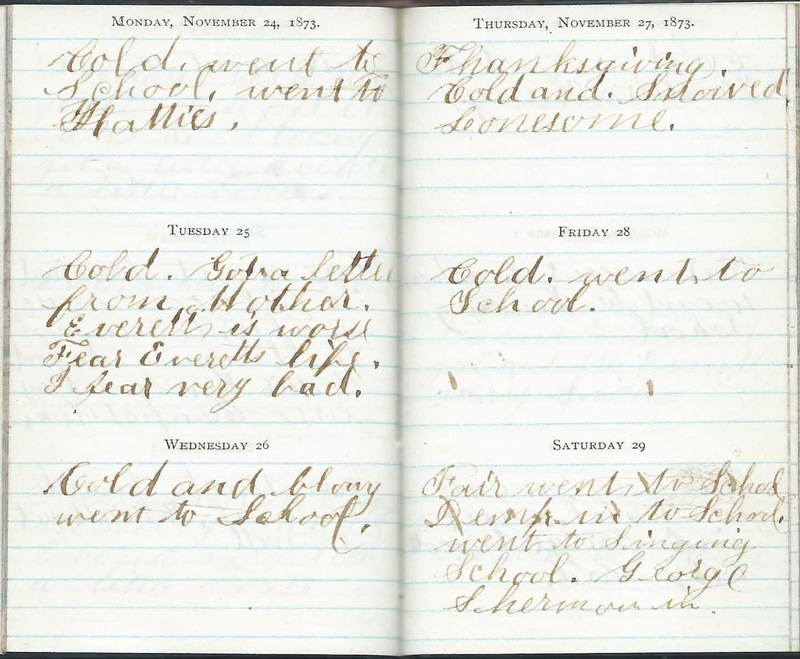 Thursday, December 4, 1873: I went to School. Got a letter. Everett very Sick. 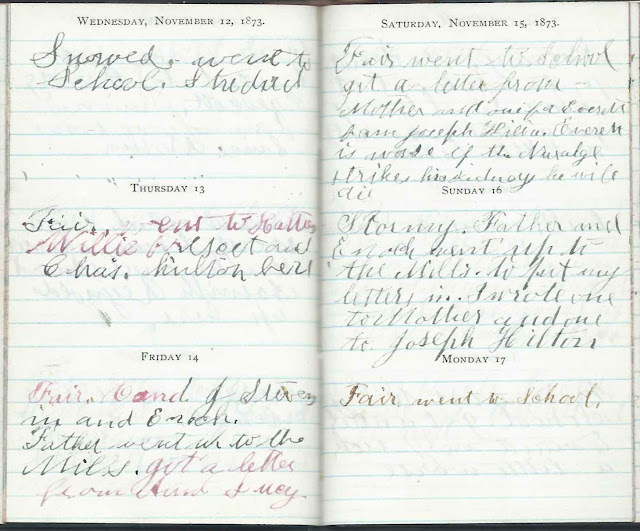 Friday, December 5, 1873: Went to School. 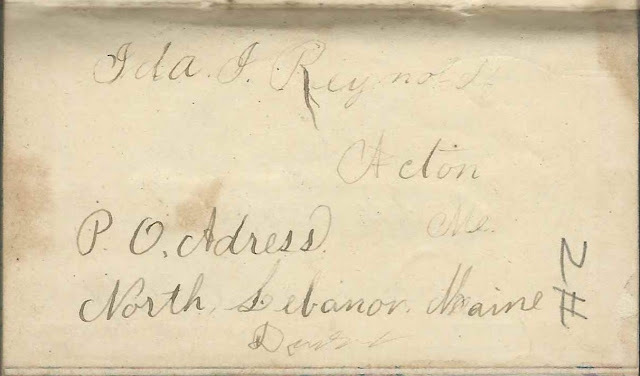 Advance to December 1873 or return to October 1873.